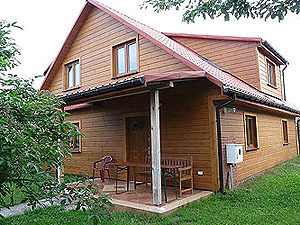 Indpendent cottage in a farm building complex located approximately one km from the village of Siemianowka among meadows and forests of the Bialowieza Forest. This wooden, two-storeyed, all-year openedbuilding with gas heating is being during the expansion now. The whole ground floor is at guests` disposal.The whole ground floor of the house or two rooms ( upper standard room in the new part of the building and standard room in the old part of the building) can be rented. Upper standard room (with an area of 20 square metres) has two independent entrances: first one from the hall of the building, second one from the big terrace. It is also connected with the bathroom. The room is equipped with bed, double sofa bed, convertible double sofa, TV set, table, wardrobe, fridge and microwave. Standard room is situated in the old part of the building. The sitting room with the kitchen annexe leads to the entrance of this room. There is also the entrance from the sitting room to the bathroom, which is at guests` disposal. The standard room is equipped with wide bed, double sofa bed, TV set, table and cupboards.The tiled stove can heat up this room. In the sitting room with kitchen annexe there is a traditional tiled stove called “plita” where meals can be cooked and bread as well as well babka ziemniaczana can be baked. During wintertime this tiled stove can heat up the sitting room. That is a perfect place for meetings, preparing and eating meals. The kitchen annexe is wholly equipped with dishes and tableware. Fridge, gas cooker, table with chairs are available. In the later timefirst floor rooms will be put at guests` disposal. There is also the orchard with ecological fruits, from which you can make preserves for winter. In the special adapted barn you can find old agricultural machines, flax processing tools and looms, on which you can weave handmade carpets under the supervision of specialist. This agritourism farm is an ideal, resting place for all those who seek for tranquility and silence, who would like to ride in a horse-drawn carriage (Bonanza type) and trytheir skills at the loom and on the pottery wheel. They can bake traditional country bread in the bread stove themselves. For every additional person in the room there is an extra charge of 15 zlotych per person a day. One room with marriage bed, sofa and TV set and second connecting room with kitchen annexe, convertible sofa and bathroom. For maximum of six people. For every additional person in the room there is an extra charge of 15 złotych per person a day. These prices are not applied to long weekends and New Year`s Eve time. They can be a little higher during this time. For the minimum of seven-night stay the bike rental for two days is free.